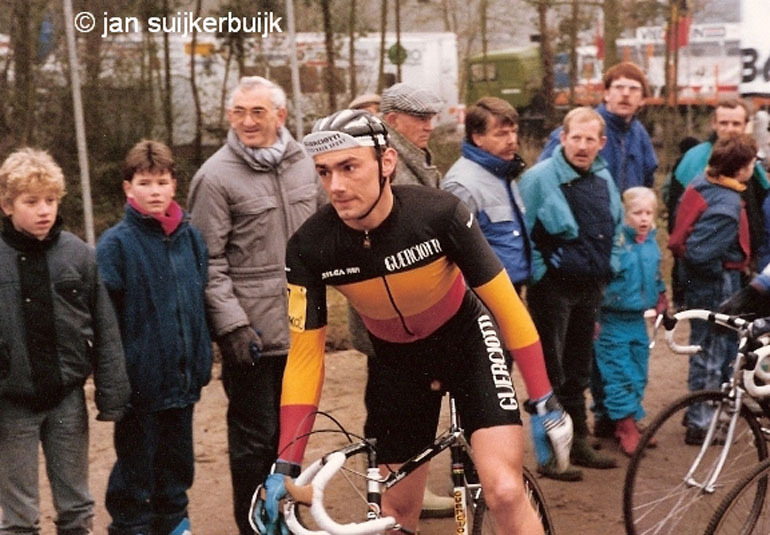 From 1980 up to 1989, no one seemed to be able to beat the ‘enfant terrible’ of cyclo-cross. But guess what: It is not the impressive palmares, but his jersey that gets most of my attention. I forgive Liboton for the blue gloves in the above picture, by the way. That said, this long-sleeved jersey from his Guerciotti era is to my opinion the closest the Belgian Champion jersey can get to perfection… without breaking the rules. So what makes this mid-eighties jersey greater than any ‘official’ Belgian jersey we see nowadays? Is it the minimalistic design with white logo’s? Is it the Guerciotti font? Is it the way the tricolor bends around the athletic chest? Is it the perfect balance of horizontal bands which is also reflected in the arms? Is it the low-profile collar? Is it the warmth of the vintage colours? I believe it is all of the above. I also believe it has nothing to do with the personality of the rider; Sven Nys, Philippe Gilbert, Tom Boonen, … they would all look great in this jersey. Until sponsors and team managers understand that less could really be more, however, Liboton’s Guerciotti jersey is the best we can get. Luckily times are changing and ‘single-sponsor’-teams are becoming fashionable again. Sky, BMC, … my bet is on you! I agree. Best jersey of all time.